With such concerning statistics, it is important that you offer your family and your home the best defence against such crimes. Prior to a burglary, thieves will often ‘case’ your home. Scanning the houses on a street; opportunists will look for a vulnerable property with easy access points. A home with open windows, or that is found to have its doors unlocked when tested are prime targets. Mistakes such as these make the perpetrator’s task so much easier. So, what exactly causes your home to appear an attractive proposition to a burglar? • High vegetation, trees & shrubbery, (esp. types that cover your windows) – this reduces the chance of being spotted when the burglar breaks your window. The more cover, the better. • Children’s toys in your garden – This acts as a sign to the burglar that a mother lives here, who is likely to have jewellery and other items of value. • Student ‘To Let’ Signs – Multiple students often equate to multiple phones, laptops, wallets, iPads and other such easy-to-carry items. • DIY Equipment left out – Ladders, hammers, bricks, chisels and shovels all offer the burglar a means of entry. • Rotting gates or gates hanging off their hinges – Sheds are only secure as their lock fixtures. Also, even with the best lock, poor hinges can be easily unscrewed by a burglar to access bikes and other such valuable equipment within. • Cluttered porch – Ensure that you cancel your milk and eggs delivery when on holiday, and have a family friend collect any mail, as these items identify an empty home to an opportunist thief. • Unlocked windows, porches and doors – According to derbyshire.police.uk, ‘Two-thirds of burglars gain entry through a door and one third get in through a window. Ensure that your home’s entry points are all locked securely. • Unlocked cars – A burglar will sometimes test your car doors before getting too close to your home. If they are found to be unlocked, it’s a sure sign that the security of the home will also be lacking. 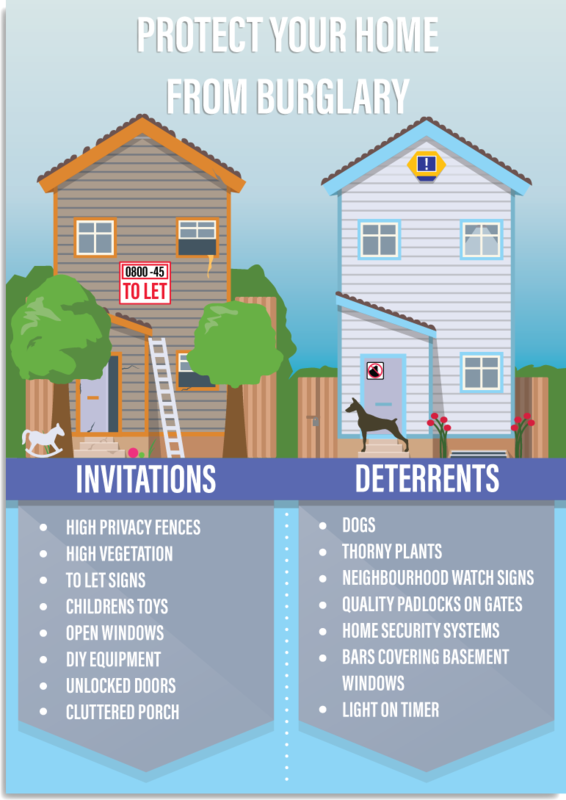 • Neighbourhood watch signs: Isolated homes are often selected by burglars as they believe they are less likely to be seen. Neighbourhood watch signs give the impression that there is a greater chance of the perpetrator being spotted and reported. • Home security systems: House alarms are an effective way of deterring opportunist thieves, however, they are only effective if doors remain locked and the alarm is actually set. Many homes with house alarms are still broken into owing to the alarm not being activated. • Quality padlocks on gates: Opportunist thieves are unlikely to invest the time or effort of trying to tackle a gate with a strong, quality lock. • Bars covering basement windows: Basement windows provide a secluded access point to the house. Bars on the windows visually demonstrates that security has been considered by the homeowners. • Motion activated lights: These devices are a useful deterrent as they notify the owner when there is significant movement happening outside. They are also useful for non-deterrent purposes, for those who own an outhouse or garage and need to access it in the darker, winter months. • Thorny plants: Lining your back wall with thorny plants will decrease the likelihood of perpetrators entering from the back garden. • Light on a timer: The 2014/15 CSEW showed that property crimes happened mostly in the evening or night. When away from your property, programming your lights to switch on and off through a timer will give burglars the impression that the house is still occupied. • Keep valuables out of sight: Do not leave your valuables on the counters where they could be seen through the window. Selecting somewhere less obvious than a drawer will increase the chance of a burglar leaving empty handed, as most will stay no longer than 12 minutes. • Mobile Phone Alarms: Some house alarms are phone-friendly and allow you to synch the two devices, so in the case of a burglary, you can view what is happening at your property and act, even when away from the house itself. • Dogs: The majority of opportunists will not target a home if they believe a dog is there. However, if you are not a ‘dog person’, a simple warning sign ‘beware of the dog’ will suffice. Owing to the fact that the majority of burglaries go unreported or do not end being discovered, it is vital that you evaluate just how secure your home really is and how to deter burglars from your home. Defence is by far the best means of attack against such crimes, and the safety of your family, possessions and memories is paramount. The price of deterrents that will deter opportunist thieves from your home is minimal by comparison to that of your peace of mind, the cost a burglary and your family’s safety.